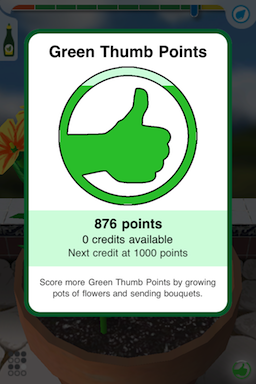 Every time you grow a pot of flowers or send a bouquet, you earn some amount of Green Thumb Points. The more rare and difficult the flowers you grow, the more points you get. Once you earn enough Green Thumb Points, you will earn a credit that can be redeemed in the Flower Shop to get any item for free. You can check your Green Thumb Point progress by tapping the bottom right button in the pot or bouquet screen.